A fresh business publication by Transparency Market Research (TMR) has detected that the shares in the micro tactical ground robot market is distributed among a small chunk of players. The report has identified Boeing Co., QinetiQ, Thales S.A., Northrop Grumman, Roboteam, and iRobot Corp. as the top six players in the global micro tactical ground robot market who collectively reserved 64% of the shares in 2016 and are expected to retain their leading position in the near future. The consolidated nature of the competitive landscape of this market is a reflection of technological expertise that is within the capabilities of only a few players. For example, Northrop Grumman oozes from over seven decades of experience in advanced autonomy and is the numero uno provider of ground robots in the U.S. In September 2017, the company’s subsidiary Remotec Inc. introduced its new member of the AndrosTM line of proven unmanned ground vehicles (UGVs), the Interoperability Profile (IOP)-compliant Nomad. The newest UGV functions with four independent track pods that enables stability and mobility in order to climb uneven terrain and overcome complex obstacles as well as inclines as steep as 60 degrees. Over the course of the forecast period of 2017 to 2025, the analysts of the TMR report have projected the demand in the global micro tactical ground robot market to increment at an impressive CAGR of 17.3%. The report estimates that the opportunities in AED market, worldwide, will translate into a revenue of US$6.36 bn by the end of 2025, substantially more than its evaluated worth of merely US$1.57 bn in 2017. Application-wise, the TMR report segments the market for micro tactical ground robot into surveillance and reconnaissance, intelligence, explosive ordinance disposal, law enforcement, hazardous material (HAZMAT), and chemical, biological, radiological, nuclear, and explosives (CBRNE). Among these, the explosive ordinance disposal segment provided for the maximum demand in 2016 and is expected to remain most prominent throughout the forecast period. Based on mode of operation, the market has been bifurcated into tele-operated, tethered, autonomous, and semi-autonomous. The tele-operated micro tactical ground robot category provided for more than half of the total demand. Geographically, the report highlights North America are the most lucrative region, providing for 45% of the total demand in 2016, gaining strong traction from the technology-savy country of the U.S. Europe is currently rated as the second most lucrative region. 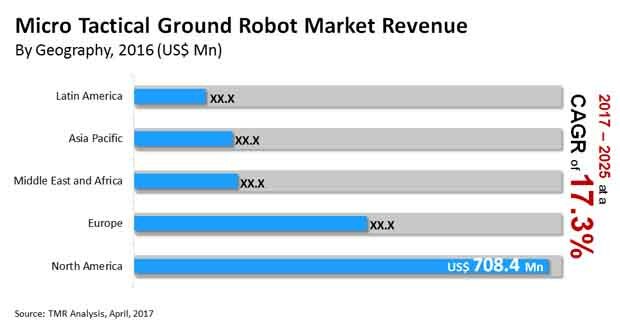 The substantial chunk of spending on security measures by a number of developed countries is the primary driver of the global micro tactical ground robot market. That being said, several emerging economies have also incremented their defense budgets in order to cope up with the challenges of territorial disputes. There is a pressing need for consistent intelligence and enhanced measures of surveillance and reconnaissance for low enforcement. In addition to that, growing number of terrorism acts across the world has prompted many governments to spend on explosive ordinance disposal. Increasing activities of oil explorations and mining activities are also expected to provide traction to the market. All these factors are collectively reflecting positively on the global micro tactical ground robot market. On the other hand, the high cost of these robots is obstructing the market from attaining its true potential in several emerging economies. The report provides in-depth analysis of each of these factors and their eventual impacts have been anticipated.